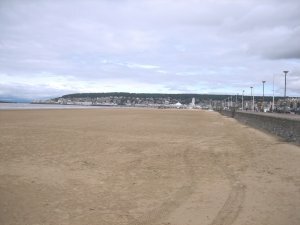 Weston super Mare is fortunate enough to enjoy one of the longest and naturally occuring beaches in the UK. 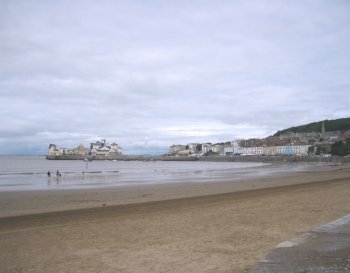 It is no wonder that tens of thousands of tourists flock to Weston each month to enjoy the golden sands. Weston looking North from the end of the Prominade. Events like T4 on the beach, Enduro, sand sculptures, and dozens of other activites all use the natural resource to its fullest. The local council keep the beach clean and local amenities up to full service to ensure that everyones visit will be remembered fondley. Two pictures on a website do not do the beach justice, visit for a day and take a walk along the beautiful sands yourself. Looking North across to the recently re-developed Knightstone Island. A little known fact about Weston is that it has the second highest tidal range in the world. A massive 15 meters, This has given rise to the name Weston super Mud over the years. But do not be fooled Weston has an amazing beach, its only if you fancy a walk to Wales that you will certainly find some sticky mud. Please note, DO NOT try to cross to any land mass across the Mud, YOU WILL get stuck.